For lack of an original idea, I can tell you this dish represents two great tastes that taste great together. It’s not candy, but the principle applies. The tomatoes on their own are full of flavor after baking with balsamic vinegar, olive oil, and fresh oregano. 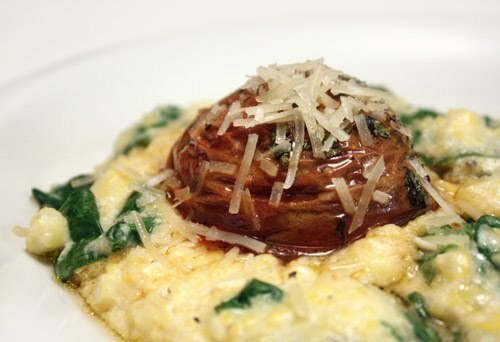 The polenta is balanced with parmigiano reggiano richness and the fresh taste of spinach. Each component is noteworthy on its own, but put them together and what you get is a step above that. I wanted to try this as soon as I first read Donna Hay’s Off the Shelf earlier in the year. At the time, it wasn’t tomato season yet, so I waited. When the season got here, I of course, had completely forgotten about the dish. Luckily, I flipped through the book again last week and was reminded of it just in time. It’s quick to prepare because the polenta is cooked while the tomatoes are in the oven. The tomatoes were halved and placed in a baking dish. Then, balsamic vinegar, olive oil, fresh oregano leaves, and a pinch of sugar in my case, since I reduced the amount, were combined and poured over the tomatoes. This was baked for 20 minutes at 400 F. Meanwhile, milk and water were brought to a boil, polenta was slowly whisked in and then stirred until cooked, shredded parmigiano reggiano and fresh spinach were incorporated, and I added some kernels of fresh corn as well. The polenta was served with tomato halves on top, pan juices from the tomatoes were spooned over it, and it was finished with a little extra shredded parmigiano. I tasted the two parts of the dish separately and thought both were great. Then, I tasted them together and realized what a great combination this was intended to be. 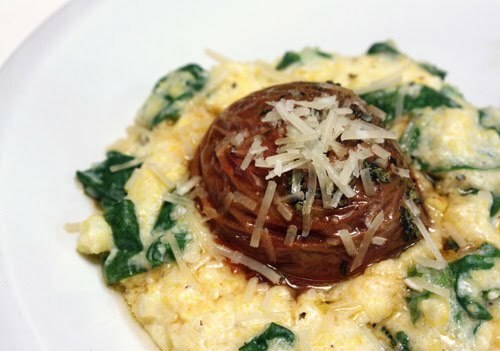 So go ahead and put some balsamic roasted tomato in your spinach polenta, and you’ll see what I mean. What a fabulous dish! A nice combo! Lisa, I am jealous that you could easily get all kinds of fresh fruit and vegetables! I love balsamic...anything with balsamic would be right for me. This looks delicious. Roasted tomatoes are like candy if you ask me. What a delicious combination! I definitely have to try this. Might still be a couple of days left to get heirloom tomatoes at the farmers' markets here in ny! This looks unbelievable, Lisa! I'm bookmarking it on Delicious to come back to when it cools off here in Texas. This will be a perfect fall vegetarian dinner! Yum! It sounds delicious. I love tomatoes and balsamic and warm on soft polenta....delicious. I borrowed off the shelf and loved it! I wonder whether it is still in print, I would like to buy a copy. Laura: Thank you! Yes, Off the Shelf is still in print. I included a link to Amazon in the post. When I bought it, I think I had found it at Barnes and Noble. the tomatoes are lovely. I'm sure they are perfect for this dish! How creative! This looks soo good! This looks excellent! I love polenta! All the flavors sound complimentary and so delicious! I have the same book and this looks like a delicious recipe. Moreover; I have never made polenta before, so that will give me a change to try it out! Those tomatoes look beautiful! We must have had the same thoughts, because I made a polenta dish over the weekend too. The polenta looks so creamy and the tomatoes look and sound really good with it! I've just recently discovered polenta..this looks awesome! I so wanna try this dish, all the ingredients you used are my favourite ^^. 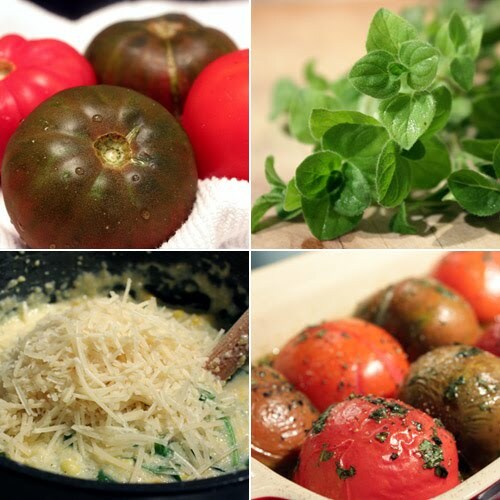 Roasted tomatoes sound wonderful together with polenta - can't wait to try this combination, yum! Love everything about it, especially the cheesey polenta. Polenta's near and dear to us. That polenta looks so good with the tomatoes. Remember in Jerry Maguire where she says, "You had me at hello."? YOu had me at the name of this dish. Some of my very favorite things here. I haven't made polenta in far too long. i won't lie--the shriveled tomato looks a bit off-putting to me. that said, once i got past that small issue (in approximately 2 seconds), i'd devour a plate of this and ask for more. You have managed to include nearly all of my favorite ingredients in one dish. This is better than candy. This is the perfect comfort food for me. Polenta with tomatoes is so good, and a little sausage never hurt anyone either, right? Be. Still. My. Heart. We are total freaks for spinach. I think it's an addiction. Or obsession. Gorgeous pictures too! What a good looking meal! It looks beautiful and sounds healty! That looks like a bowl of heaven! Love the idea of the balsamic. Vinegar is one of the best-kept secrets in the kitchen. A little of it in so many dishes just does magical things. I love drizzling a little into soups just before serving. Just adds such depth of flavor. This looks absolutely fantastic...I love polenta! MMMMMMMMMMM,...I adore a good polenta & your added flavours temp me a lot!! This is a great combo of flavors & can easily be a complete meal for me anytime! Balsamic tomatoes sounds awesome, never tried it bet it is great. I am not a big fan of polenta but the way you prepare makes me curious and probably will make me change my mind. I absolutely love tomatoes, and I know this would be a great vegetarian dish for hubby and I! I am so going to make this! I have pounds of Black Krimm tomatoes sitting in bowls on my countertop after a mad dash to harvest before the frost. But the spinach just keeps on chugging. Thanks for the idea! Your cookies have the perfect color because you baked them correctly. Can you share this recipe on Half Hour Meals, please and the ganache proportions of components, please? I confess, I probably give polenta short shift, but after seeing this absolutely delicious dish - no more! I have to have it!